1/2 Horse Power - 250 Watts 18/10 Stainless Steel Screen Double Threaded Screw Feeder Heavy Cast Iron Neck Treated with Special Resins - 2" Diameter Large SP3 Stainless Feed Bowl - 10.5" Diameter x 4.5" Depth Permanently Lubricated Spheroidal Cast Iron Main Gear Production: 300 pounds per hour Output Revolutions: 120 per minute Motor: Asynchronous with Condenser The MR3 is a special offer Fabio Leonardi machine. Developed with a 1/3 HP this compact electric tomato milling machine offers home or light commercial tomato milling assistance. What is special about this unit is that the neck has been specially designed to fit the SP3 attachment bowl. This bowl offers significantly more capacity than the SP2 enabling more efficient milling. It is ideal for squeezing both unprocessed or boiled tomatoes and other fruit and vegetables suitable for producing juices, purees and conserves. 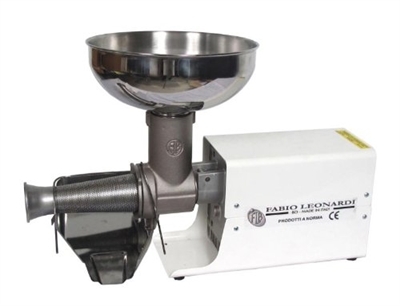 For tomato milling machines, meat grinders and sausage stuffers, there really is no other choice for quality, reliability and style. Made in Italy!